Home | Blog | Toilet Cleaning Hack You Need to Try ASAP! The surprising simple toilet hack that is said to get rid of bathrooms smelling like urine for good. 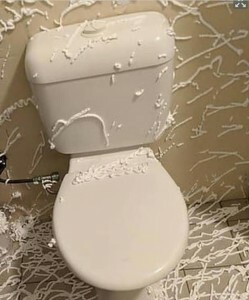 Although quite messy, the trick involves lathering the floors of the bathroom/toilet with shaving cream and letting it sit until the lingering urine smell finally disappears. On the Facebook group Mums Who Clean, hundreds of mothers shared photos of tiled floors and walls completely covered in shaving cream and claimed no product had worked better, the Daily Mail reported. “I’d just like to say a huge thank you to the beautiful mum who said to use shaving cream in the toilet to get rid of urine smell. I sprayed it everywhere and rubbed it in went back a few hours later to wipe down and the smell has gone,” one mum posted on the site. Cheap and easy! Awesome tip thanks. It worked like a dream and wasn’t too bad to wipe up the shaving cream. It beat using stinky chemicals in my small toilet space. Couldn’t stand the mess – lots of other things do the job equally well and without all the mess. Shaving cream! I’ll definiteky try it but I don’t think I’ll spray it all over the floor though… I might try spraying the shaving cream into the mop and wipe it on the floor instead…?! Hmmm, I think I need this right now. But, it looks so messy and like I’m just creating more work for myself. I think the males in my house need to do this!! It would take ages to clean up afterwards. That would take forever to clean. A good spray and wipe does the job for the walls ( I tried that ). 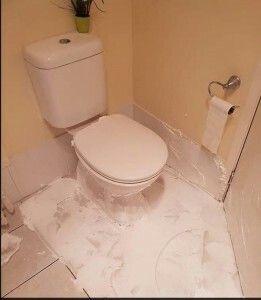 I am not going to try the shaving cream , it looks like a pain to clean up.Spray and wipe for the tiles in between the cleanings does the trick too. Too messy, too expensive, and too time consuming, there are better ways of cleaning and without chemicals. I have know idea how I’d begin to clear that up, and then what happens once they pee again? That’s a lot of mess to clean up. I would be making the people that pee everywhere clean it up and they might be more motivated to pee in the actual toilet rather than on the floor. I always wonder how people come up with these ideas.